As a teacher, I sometimes have the opportunity to travel in many countries around the world. Before each trip, I always make sure I understand two important things. First, I need to know where I am going. And second, I have to know how I will get from place to place. Will I take an airplane? Catch a bus? Or use some other form of transportation? Well, something similar is true when we read the book of Acts. It helps to know where the story is going and what literary techniques or strategies Luke uses to guide us to our destination. This is the second lesson in our series The Book of Acts. In this series, we are exploring the record of the early church as it continued the ministry of Jesus. We have entitled this lesson "Structure and Content" because we will be looking at the ways Luke organized his material, and at the message he intended to teach. 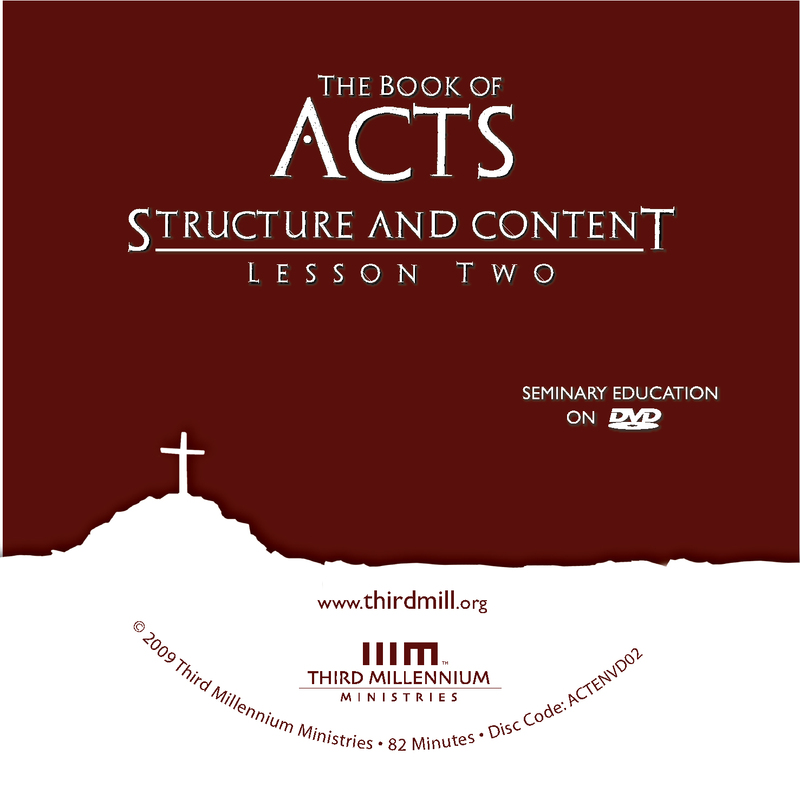 Our exploration of the structure and content of Acts will divide into three parts. First, we will examine the rhetorical strategy of the book, looking at how Luke's approach to writing Acts should influence the way we interpret it. Second, we will examine the book's content, noting the arrangement of its material, and considering how it would have been understood in the first century. And third, we will suggest a model for the modern application of the book, considering how Luke's ancient message can speak authoritatively in our day. Let's look first at the rhetorical strategy of the book of Acts. Whenever we read a book in the Bible, it is important to become familiar with the way the author persuades his readers of his points of view. We have to ask questions like: Why did the author write this book? What authorities did he appeal to in order to establish his case? And how did he design his book to guide his readers to the proper conclusions? The answers to these questions yield so many insights that we should never ignore them. As we approach the book of Acts, we will focus on three aspects of Luke's rhetorical strategy. First, we will speak of his stated purpose. Second, we will mention his reliance on authority. And third, we will speak of some structural patterns he employed throughout the book. Let's start by examining Luke's stated purpose for writing the book of Acts. When people write works of significant length and complexity, they normally have many intentions and purposes. And this was true for Luke as he wrote his two-volume work of the Gospel of Luke and the book of Acts. He hoped that his writing would impact the lives of Theophilus and the church in many different ways. So, we have to be careful not to oversimplify his purposes. Even so, Luke explicitly stated that he had a purpose for his work. As we will see, Luke plainly stated that he had a twofold purpose as he wrote. On the one hand, Luke declared that he had historical intentions, a desire to write a true and reliable historical account of the church in the first century. And on the other hand, he declared that he had significant theological intentions: a desire to convey and confirm the truth and significance of the gospel message. We will look at both aspects of Luke's twofold purpose, beginning with his intention to write a true historical account. Many have undertaken to draw up an account of the things that have been fulfilled among us, just as they were handed down to us by those who from the first were eyewitnesses and servants of the word. Therefore, since I myself have carefully investigated everything from the beginning, it seemed good also to me to write an orderly account (Luke 1:1-3). Luke's concern with true history is apparent in several ways in this passage. He referred to "the things that have been fulfilled among us," that is, historical events that had taken place. Luke also mentioned that he had consulted "eyewitnesses" and that he had "carefully investigated" the details he recorded. He also took care to write an "orderly account" so that the truth he reported would be communicated clearly and accurately. In short, Luke intended his two-volume work of the gospel and Acts to provide a true historical record, beginning with the life of Jesus in the gospel, and continuing with the first-century church in the book of Acts. Luke was concerned about recording true history because he understood a basic principle repeated throughout the Bible: God reveals himself in real history, in space and time. He works through history to bring about his salvation and judgment. Unfortunately, in recent centuries many critical scholars have argued that the concepts of "salvation" and "judgment" are mutually exclusive from real history. Generally, they have asserted that supernatural acts of God simply do not occur in history, in actual space and time. They believe instead that real history is merely natural, not supernatural. As a result, when critical theologians read about acts of God in Scripture, they often treat these accounts as expressions of nonfactual religious sentiments, a sort of "pious fiction." But Luke himself made it clear that he was not trying to write pious fiction; he intended to report real history. In fact, he wrote in a way that made it easy to verify or to disprove his claims. As just one example, Luke located his accounts within well-known historical contexts. In the book of Acts, for instance, we find references to men such as Gamaliel, in 5:34, Gallio, in 18:12, Felix, in 23:26, and Festus, in 24:27, all of whom were well-known in the ancient Jewish and Roman world. By mentioning these men and other historical details, Luke made it possible for his readers to examine his research independently. They could speak with others who had knowledge of these people and events he reported, and in some cases they could read the writings of others on the same subjects. Had Luke's reports not been true to fact, it would have been easy for skeptics to refute them. Especially since the end of the 19th century, a number of scholars have examined the historical veracity of Acts by comparing it with many extra-biblical texts and other archeological data. Many of these studies have indicated a number of ways in which Luke was a reliable historian, but time will only permit us to mention a pair of specific examples. First, in Acts 28:7, Luke reflected knowledge of specific historical terminology. There he referred to the leader of the island Malta as "the first of the island." This unusual terminology has puzzled many interpreters through the centuries, but recent archeological research has shown that this actually was the leader's official title at that time. Second, in Acts 27:21-26, Luke described Paul's actions onboard ship in ways that have been confirmed by historical research. There Luke wrote that Paul spoke to the entire crew of the ship that was carrying him to Rome, advising and encouraging them during a great storm. Many critical scholars in the past argued that it would have been impossible for Paul as a prisoner to speak openly in this manner. So, they concluded that Luke had created a fictional heroic portrait of the apostle. But recent research has shown that first-century maritime law permitted anyone on board to speak and to advise the crew when ships were in serious danger. These examples illustrate Luke's fidelity to the facts of history. And his intention to write an account of actual historical events reminds us that God's eternal truth is not somehow detached from the concrete realities of life. Rather, in biblical faith, salvation comes in and through real history. This is why Luke was so concerned with writing a true historical account. It seemed good … to me to write an orderly account … so that you may know the certainty of the things you have been taught (Luke 1:3-4). As we see here, Luke wrote the history of Acts to confirm what Theophilus and others had been taught. This means that the book of Acts may rightly be characterized as a sort of catechetical or didactic history. Luke wanted Theophilus and his other readers to adopt certain points of view, certain theological convictions, certain perspectives on the theological significance of historical events he reported in the book of Acts. As we saw in an earlier lesson, Luke viewed the world and all of history through the lens of Christ's lordship and kingdom. He saw the Old Testament hopes and promises being fulfilled through Jesus and the church. And he wanted Theophilus to view his record of events in the early church through this lens, to see how Christ, through the Spirit of God, had established and was continuing to build up the kingdom of God in Christ. So, as we read the book of Acts today, we must always keep in mind that Luke was not just recording true facts so that we would know what happened long ago. Rather, he was also drawing attention to teachings that were foundational to the church: the reliable witness to the continuing work of Christ through the Holy Spirit. With Luke's twofold stated purpose in mind, we are ready to consider a second aspect of his rhetorical strategy: his reliance on authority. Luke did not assert the historical and theological truths he recorded on the basis of his own authority, but on the authority of Christ and his apostles. In this way, Luke served as a true witness of the gospel. One thing that is striking in Acts is the amount of material devoted to the words and deeds of those who served as key witnesses to Christ. When Christ ascended to heaven, he named his apostles as his witnesses and gave them authority, in dependence upon him, to continue his kingdom work. He periodically empowered prophets and other prominent church leaders to proclaim his message as well. And as Luke sought to persuade Theophilus and the wider church of his perspectives, he turned time and again to early church leaders, especially apostles and prophets, to illustrate and to authorize his own outlooks. To explore Luke's reliance on authority in more detail, we will focus on two matters. First, we will consider the way Luke appealed to authoritative words. And second, we will look at his references to authoritative deeds. Let's begin with Luke's emphasis on words that carried authority in the church. As we mentioned in our prior lesson, Luke was not an apostle. He probably came to faith after Christ's ascension into heaven. During his travels with and without Paul, Luke investigated the ministries of Jesus and the apostles, and recorded the testimony of the Lord's chosen eyewitnesses. Now, in one sense, all followers of Christ are his witnesses. But, when the church was being established, Jesus commissioned the apostles to be his infallible witnesses. They were the only ones he appointed and empowered to serve as permanent, authoritative witnesses on earth in his absence. Beyond this, the Lord called prophets and other authorized church leaders, such as Luke, to testify authoritatively on an occasional basis. The most prominent way Luke presented authoritative words was to record speeches. Rather than simply commenting on the teaching of the church, Luke regularly recorded extensive discourses, allowing the Lord's authoritative representatives to speak for themselves as active characters in his history. In fact, about thirty percent of Acts is composed of debates, dialogues, monologues, sermons and other types of oral presentations. This is a far higher percentage of speech material than we find in other ancient narratives, probably because Luke relied on speeches as an appeal to the authority of the apostles. Altogether, there are about 24 speeches in Acts: eight from Peter, nine from Paul, one from Stephen, one from James, and a few from others. And the vast majority of these speeches are made by apostles; the rest are mostly made by prophets and prominent church leaders. But why is this important? The speeches in Acts tell us who the early church leaders were and what they thought about many issues. They show us why the disciples were willing to suffer for the sake of Christ. They bear witness to the apostles' service to Christ and record their instructions for building his kingdom. They also authorize Luke's perspectives on the history of the early church. Now, there have been many critical scholars in the nineteenth and twentieth centuries who do not accept that Luke provided true reports of the speeches he included in Acts. And we have to admit that there are examples in the ancient world of historical accounts in which speeches are not based on fact. But a number of critical and evangelical scholars point out that many historians before, during and after Luke's day worked hard to ensure that the speeches in their histories were true representations of actual speeches. And in fact, as we look more closely at the speeches in Acts, we find convincing evidence that Luke was one of these reliable historians, so the speeches he included really do represent authoritative apostolic teachings. We primarily have confidence in the records of speeches in Acts because Luke was inspired by the Holy Spirit to write an infallible and authoritative history. Nevertheless, there are at least four other ways we can see that the speeches in Acts are accurate representations of real speeches. First, the speeches have their own style. By comparison with other portions of Acts, they seem natural, with a simple style. Some of them employ rough, unpolished Greek. This shows that Luke was more concerned with writing down what speakers actually said than he was with refining and modifying their speeches. Second, the speeches fit very well into their respective contexts. Each speech is tailored to the speaker and the audience. For example, in Acts 4, Peter spoke to the Jewish leaders after healing a lame man. And although his speech proclaimed salvation in Christ, which we might expect if Luke had invented it, Peter appealed directly to the healing as proof of his words. Moreover, the unbelieving Jewish leaders could not refute Peter because they themselves witnessed the healing. In a similar way, Paul's speeches reflect their respective contexts. For instance in Acts 13, he spoke very differently to Jews and God-fearers in Pisidian Antioch than to Stoics and Epicureans in Acts 17. Third, each speech reflects the individuality of its speaker. While common themes are to be expected, each speaker displays characteristic particularities. For example, Paul's speech to the Ephesian elders in Acts 20 has an amazing number of parallels to Paul's letters. This is just the sort of speech we would expect from the author of these letters. Fourth, in some places, Luke explicitly stated that he had summarized or abbreviated certain speeches. For instance, in Acts 2:40, he mentioned that Peter also spoke "many other words." This should incline us to believe that Luke's goal was generally to provide a fuller representation of actual speeches in their original contexts. In these and a number of other ways, we can have assurance that Luke provided historically true speeches. He did not invent or fabricate the speeches in Acts to suit his purposes. Instead, he rested the authority of his own comments and narrative elaborations on the actual authoritative witness of the apostles. In addition to recording authoritative words, Luke also relied on accounts of authoritative deeds performed in the early church to support the theological message he conveyed through the book of Acts. The Holy Spirit empowered the apostles — and sometimes prophets and other prominent leaders in the early church — in many miraculous ways that validated their gospel message. Through miracles, from dramatic spiritual gifting to healings to raising the dead, the Holy Spirit testified that the apostles were Christ's authoritative representatives. The proconsul, an intelligent man, sent for Barnabas and Paul because he wanted to hear the word of God. But Elymas the sorcerer … opposed them and tried to turn the proconsul from the faith. Then …. Paul, filled with the Holy Spirit, looked straight at Elymas and said, " … [T]he hand of the Lord is against you. You are going to be blind, and for a time you will be unable to see the light of the sun." Immediately mist and darkness came over him, and he groped about, seeking someone to lead him by the hand. When the proconsul saw what had happened, he believed, for he was amazed at the teaching about the Lord (Acts 13:7-12). As Elymas tried to hinder the gospel, the Holy Spirit empowered Paul to strike him with blindness. And Paul's teaching and actions persuaded the proconsul that his gospel was true. Luke recorded authoritative words and deeds so that his readers would be persuaded of the truth of his accounts. He wanted his readers to see that the apostles were authorized by the Lord Jesus, and that the church in all places and generations was obligated to follow their witness as they continued to build the kingdom of God in dependence upon Christ. Now that we have looked at Luke's stated purpose and reliance on authority, we are ready to turn to a third dimension of Luke's rhetorical strategy: the structural pattern that Luke employed throughout the book of Acts. The book of Acts displays many structural patterns, but for the sake of time we will focus on two facets of the structure of Acts. First, we will explore the prominent pattern of repeated summary statements. Second, we will look into the pattern of church growth that appears in Acts. Let's begin with the way Luke used summary statements. Biblical writers make their presence known in narratives on many different levels. Sometimes, for all practical purposes, they hide themselves behind the action of a story. At other times, they step forward to make explicit comments on what takes place in their accounts. We speak of this latter technique as authorial comments. Luke made many authorial comments throughout Acts. He gave background information, revealed the intentions of characters' hearts, described settings and so on. He did this to ensure that his message was presented clearly and faithfully. One of the ways he often commented on events in his book was through summary statements. Many readers have noticed that the book of Acts describes the gospel's progression from Jerusalem outward. And at a number of steps along the way, Luke paused to summarize events up to that point. We will explore how Luke used summary statements for six periods of time in his history: the success of the gospel in Jerusalem, in Judea and Samaria; from Samaria to Syrian Antioch; in Cyprus, Phrygia and Galatia; in Asia, Macedonia and Achaia; and from Jerusalem to Rome. [Paul] stayed two full years in his own rented quarters, and was welcoming all who came to him, preaching the kingdom of God, and teaching concerning the Lord Jesus Christ with all openness, unhindered (Acts 28:30-31, NASB). Now that we have seen that Luke drew attention to certain features of his history through summary statements, we should look at the pattern of church growth that emerges between these summary statements. When Luke described the growth of the church, he regularly mentioned two pairs of dynamic forces. On the one side, he wrote about internal growth and tension within the church. And on the other side, he wrote about external growth and opposition from outside the church. We will illustrate this pattern later in this lesson, so for now we will simply describe what we mean. By the term "internal growth," we are referring to the positive effects of the gospel within the Christian community. We might say that this was a form of qualitative growth, furthering the spiritual maturity of individuals and of the church as a whole. And by the term "tension," we have in mind the problems, questions, controversies and struggles that occurred within the church. In the book of Acts, Luke regularly demonstrated that there was a reciprocal relationship between internal growth and tension. Internal growth led to tension, and tension led to internal growth. The second pair of elements in Luke's structural pattern of church growth is external growth and opposition. By "external growth," we have in mind that the church increased numerically by adding new members. This form of growth was quantitative. And by the term "opposition," we are referring to the fact that conflict frequently arose between the church and the unbelieving world as unbelievers reacted negatively to the gospel. Once again, there is a reciprocal relationship between these two ideas in Acts. External growth sometimes led to opposition, and opposition led to the external growth at times as well. Moreover, Luke often demonstrated that there is a reciprocal relationship between both of these pairs of elements, between internal growth and tension on the one side, and external growth and opposition on the other side. In other words, Luke regularly pointed out that internal growth and tension yield external growth and opposition, and that external growth and opposition cause internal growth and tension. As we will see later in this lesson, this pattern for church growth appears so frequently in Acts that it forms a kind of conceptual framework or skeleton for the book. The summaries Luke made throughout his book explain that every major section of the book of Acts depicts the growth of the gospel as it spread through the witness of the early church. And just imagine the effect these comments should have had on Theophilus and others who read Luke's book. They would have encouraged believers everywhere that no matter how great the tension or how terrible the opposition, God is always working through the gospel for the internal and external growth of his church. They would have inclined the early Christians to read all of history from this perspective. And they would have assured them that if they remained faithful witnesses to their Lord and Savior, they would see the growth of the gospel in their day too, despite their internal and external problems. With some of the central dimensions of Luke's rhetorical strategy in mind, we now turn to our second topic: the content of the book of Acts. While there are many ways to summarize the content of this book, we will focus on the way Luke described the development of the church as the partial realization of God's kingdom on earth. Luke's two-volume work of the Gospel of Luke and the book of Acts explains how Jesus brought and began to build God's earthly kingdom through the proclamation of the gospel. In his gospel, Luke described the foundation that Jesus laid for the kingdom during his earthly ministry. And in the book of Acts, Luke described how Jesus poured out the Holy Spirit to empower the apostles and the church to continue his kingdom-building work. In this way, God's kingdom is the overarching story of both volumes of Luke's work. So, as we explore the content of Acts, we will pay special attention to the way the kingdom continued to expand under the leadership of the apostles. Here Jesus laid out a geographical strategy for the gospel witness of the church. Empowered by the Holy Spirit, the apostles were to begin witnessing in Jerusalem, then carry the gospel to Judea and Samaria, and finally to the ends of the earth, expanding the kingdom everywhere they went. Many scholars have observed that Luke organized the book of Acts around Jesus' call for geographical witness expansion. And we will follow this same pattern as we survey his work. We will look first at the way that Luke described the growth of the gospel in Jerusalem in Acts 1:1–8:4. Second, we will turn to the growth of the kingdom in Judea and Samaria in 8:5–9:31. And third, we will focus on the way the church carried the gospel to the ends of the earth in 9:32–28:31. Because this third section is so long, we will pay special attention to it, focusing on four stages of growth suggested by Luke's summary statements that we have already noted: first, in Phoenicia, Cyprus and Antioch in 9:32–12:25; second, in Cyprus, Phrygia and Galatia in 13:1–15:35; third, in Asia, Macedonia and Achaia in 15:36–21:16; and fourth, all the way to Rome in 21:17–28:31. We will look at each of these sections in more detail, focusing on the patterns of internal growth and tension and external growth and opposition that we described earlier. Let's begin with the way the kingdom in Jerusalem was established through the gospel witness of the apostles in Acts 1:1–8:4. Jerusalem was the capital city of ancient Israel, God's special nation in the Old Testament. Jerusalem was the starting point of Luke's account because of the central role it had played in God's kingdom throughout the Old Testament, and also in Jesus' ministry. Moreover, Luke wrote about events in Jerusalem at a number of other places in the book of Acts, regularly showing that the apostles' work in spreading the gospel to new lands was still rooted in this special city. Luke reported the growth of the kingdom through the gospel in Jerusalem in four major batches of narratives: first, the anticipation and outpouring of the Spirit in Acts 1–2; second, Peter's temple sermon and the persecution that followed in Acts 3–4; third, the story of Ananias and Sapphira and the persecution that followed in Acts 5; and fourth, the selection of deacons and the persecution that followed in Acts 6:1–8:4. We might have expected internal tension and outward opposition to discourage the fledgling church in Jerusalem. But under the power of the Holy Spirit, the reality was just the opposite. The gospel witness continued to go forth with great strength, ultimately unhindered in its progress. The second major division of Acts focuses on the gospel witness of the church in Judea and Samaria in Acts 8:5–9:31. The regions of Judea and Samaria were roughly equivalent to the southern and northern regions of the Promised Land given to Israel in the Old Testament. Jesus himself had ministered in these regions before his ascension. Luke's focus on Judea and Samaria can be divided into two main batches of stories: the ministry of Philip in Acts 8:5-40 and the conversion of Paul in Acts 9:1-31. These stories draw attention to the internal growth of the church. For instance, internal growth continued as new believers continued to be filled with the Holy Spirit in Acts 8, and Saul was made an apostle after his conversion in Acts 9. Hand-in-hand with these events, however, tension also built within the church. For example, questions were raised in Acts 8 because some believers had not yet received the Holy Spirit. Simon the magician tried to purchase the power of the Holy Spirit from the apostles in Acts 8. On the other hand, the pattern of outward growth and opposition also continued. For instance, the church continued to grow numerically in Judea and Samaria through events such as the many converts made through Philip's evangelistic ministry in Acts 8, and the conversion of Paul in Acts 9. Even so, this growth did not occur without opposition from unbelievers. For example, Saul persecuted believers before his conversion in Acts 9, and some Jews attempted to assassinate Saul after his conversion in Acts 9. Once again, internal tension and outward opposition ultimately failed to hinder the church. Instead, the Holy Spirit used these challenges to bring further maturity and numerical growth to the church. The third major section of Acts describes how the gospel expanded beyond the borders of the Promised Land, to the ends of the earth, as it was known in that day. As we mentioned, we will look at this section in greater detail, beginning with the advance of the gospel in Phoenicia, Cyprus and Antioch in 9:32–12:25. This section concerns the first significant spread of the gospel beyond Judea and Samaria as it extended into the nearby Gentile lands of Phoenicia, Cyprus and Antioch in Syria. In this portion of Acts, we read of Peter's ministry in Lydda and Joppa in Acts 9:32-43, Peter's ministry in Caesarea to the Gentile Cornelius in 10:1–11:18, the expansion of the gospel to Syrian Antioch in 11:19-30, and Peter's miraculous deliverance from prison in Jerusalem in 12:1-25. Not surprisingly, the pattern of internal growth and tension continued here as well. Luke recorded several examples of internal growth. For instance, Gentiles were brought into the church in Acts 10 and the church was encouraged by Peter's miraculous deliverance from prison in Acts 12. And of course, there were related tensions as well. For example, many Jews hesitated to receive Gentiles into full fellowship in the church in Acts 11, and many resisted loosening Old Testament dietary restrictions in Acts 11. In this section also, Luke emphasized the pattern of outward growth and opposition. For instance, he wrote of external growth through the conversion of Cornelius and many other Gentiles in Acts 10, and the successful evangelistic ministry of Barnabas and others in Antioch in Acts 11. But this growth was not without opposition. This persecution included the death of James in Acts 12 and the imprisonment of Peter in Acts 12. But despite the tension and opposition, the gospel witness was not ultimately hindered. The Holy Spirit continued to bless the church's evangelism and discipleship. He overcame racial divisions and persecution, even freeing Peter from prison in a miraculous way. No matter what hindrances were thrown in its path, the gospel continued to go forward. In Acts 13:1–15:35, Luke turned to his fourth major section: the spread of the gospel in Cyprus, Phrygia and Galatia. In this section, the gospel moved further from Jerusalem, Judea and Samaria, stretching into the eastern portions of Asia Minor. This section of Acts divides into two main parts: Paul's first missionary journey itself in Acts 13:1–14:28, and the council in Jerusalem in Acts 15:1-35. In keeping with his strategy, Luke reflected the pattern of internal growth and tension in this section as well. He pointed to internal growth through things such as Paul's strengthening of the churches in Galatia in Acts 14, and the Jerusalem council's decision not to demand circumcision of Gentile converts to Christ in Acts 15. Luke also mentioned internal tension in this section, especially as he wrote about the practical difficulties related to Gentile converts. Tension arose between Jewish and Gentile believers over the issues of circumcision and the rigors of the traditional Jewish diet in Acts 15. With regard to external growth and opposition, Luke mentioned many matters, such as the numerical growth generated by Paul's first missionary journey, as reported in Acts 14. But as before, this growth was accompanied by strong opposition. For example, Paul and Barnabas were repeatedly rejected by Jewish unbelievers, especially in Lystra, Iconium and Antioch, in Acts 14. Even so, the Holy Spirit continued to move the church forward and to overcome every obstacle in the path of his people. The unstoppable gospel continued to accomplish God's purposes. The fifth major section of Acts runs from 15:36–21:16, where the gospel witness was extended to the Roman provinces of Asia, Macedonia and Achaia. This portion of Acts focuses on Paul's second and third missionary journeys, during which time Paul traveled through eastern Asia Minor, as he had before, but then pressed on to the province of Asia in western Asia Minor, and across the Aegean Sea to many cities in Macedonia and Achaia in modern-day Greece. Paul's second missionary journey is recorded in Acts 15:36–18:22, and his third missionary journey in 18:23–21:16. In the pattern that should be quite familiar by now, these chapters emphasize the relationship between internal growth and tension. We find many examples of internal growth here, such as the instruction of Apollos by Aquila and Priscilla in Acts 18 and Paul's extended teaching in the synagogues of Ephesus and the lecture hall of Tyrannus in Acts 19. And of course, much tension accompanied this internal growth. For instance, Paul and Barnabas argued over Mark and parted company in Acts 15, and Paul warned the church to guard against church leaders who have evil motives in Acts 20. We also read of external growth and opposition. For example, we see external growth in the many converts Paul gained and in the churches he planted during his second and third missionary journeys in Acts 15–21. But we also see opposition, such as the angry mobs that tried to kill Paul, and the Jewish zealots who pursued Paul from city to city in Acts 17 and 20. Once again, Luke showed that the gospel spread effectively throughout the world. Internal tensions and external opposition were constant difficulties, but they could not stop the progress of the gospel witness empowered by the Holy Spirit. Finally, the last major portion of Luke's narrative concentrates on gospel witness in Rome in Acts 21:17–28:31. This section focuses on Paul's journey from Jerusalem, and then on his subsequent arrest, imprisonment and transfer to Rome. These materials roughly divide into four large sections: Paul's final witness in Jerusalem in Acts 21:17–23:11, Paul's imprisonment in 23:12–26:32, his difficult journey to Rome in 27:1–28:14, and finally, his witness in Rome in 28:15-31. As we have come to expect, these chapters include the familiar pattern of internal growth and tension. We see several evidences of internal growth, including things like the joy Jewish believers in Jerusalem felt when they heard that many Gentiles were coming to the faith in Acts 21, and the willingness of Paul and others to suffer and even to die to spread the gospel in Acts 22. But we also see that this internal growth was accompanied by tension, such as the rumor that Paul was teaching Jewish believers to abandon their traditions in Acts 21 and the consequent tension his presence caused in the church in Jerusalem in Acts 21. We also find the pattern of external growth and opposition. Luke recorded that the church made great strides in external growth during this period. For example, Paul was able to present the gospel to many high-ranking officials in Acts 23, 24, 25, 26, 28, and he preached without hindrance in Rome in Acts 28. But Luke also pointed out that strong opposition accompanied this growth, including Paul's arrest and four-year imprisonment by the Roman government in Acts 24 and Paul's imprisonment in Rome in Acts 28. Each major section of Acts proves that the faithful witnesses of the gospel had not failed. The Holy Spirit empowered the church to take the gospel from Jerusalem to the very capital of the Roman Empire. Despite the internal and external troubles that the church endured, the unhindered gospel brought the church to spiritual maturity and numerical expansion as it spread the kingdom of God to the ends of the earth. Now that we have explored the rhetorical strategy and content of Acts, let's turn to our third topic: steps toward modern application. What are some of the main issues to consider as we apply the truths of Acts in our own day? To explore this topic, we will first focus on the literary character of Acts, noting some of its main characteristics. Second, we will speak about some discontinuities between the first century and our day that impact our modern application of his book. And third, we will affirm some important continuities between the first century and the modern day that help us relate the original meaning of Acts to our own lives. Let's begin by looking at the literary character of Acts. Different kinds of literature communicate their ideas in different ways. For instance, we find many types of literature in the Bible. There are historical narratives, poems, speeches, parables, proverbs, law, and so on. And each of these types of literature communicates in different ways. If we hope to understand the book of Acts in a responsible way, we must take into account the kind of literature it is and the ways this kind of literature communicates its ideas. There are many things we might say about Acts from a literary point of view, but time will only permit us to highlight three of its more prominent characteristics. First, Luke was selective in what he reported. Second, he designed Acts to be episodic. And third, he communicated many of his teachings in implicit ways. Let's look first at the selective nature of the material in Acts. Every historian has to be selective. There are simply too many facts, people and events in the world for any human being to provide a comprehensive report of them. The events in Acts span the years from the ascension of Jesus to the imprisonment of Paul in Rome, a period of three or four decades. An astounding number of significant events took place in the church during this time — far too many to count. Yet, Luke only wrote twenty-eight fairly short chapters. So, we know that he reported only a tiny fraction of what could have been said. But how did he determine what events to include? How did he decide what to omit? Luke was led by the Holy Spirit to select those bits of history that were critical to understanding Jesus' work through the apostles, and that would persuade his readers to embrace some of the central teachings of the apostles. So, as we attempt to find ways to apply the book of Acts in the modern world, we need to do two things. On the one hand, we need to avoid the error of thinking that Luke recorded everything we might ever want to know about this period of church history. There are many questions he left unanswered, so we need to avoid looking for every answer to our modern problems in the book of Acts. On the other hand, we need to remember that each account in the book of Acts is there to help Luke accomplish his twofold purpose. So, we need to read everything in the book in light of how it helps Luke further this goal. We should constantly be asking questions like: What does this teach me about the early church? And what doctrines does it encourage me to adopt? Besides being selective, the literature of Acts is also episodic. That is to say, Acts is a successive collection of smaller stories and accounts. As we read the book of Acts, it is important to note that each of its individual narratives is part of Luke's overall strategy and message. Each one contributes in some way to his overall mission of teaching Theophilus about the gospel of the kingdom of God in Christ. So, this big picture should serve as the backdrop and context to each episode we read in Acts. But each episode is also distinct. Each one has its own smaller points to make, its own details to teach about the way the church is to continue building God's kingdom in Christ through the gospel. And this means that as we read Acts, we should not allow our attention to Luke's overarching purpose to overshadow the individual points he was making. We must pay attention to both the big and the small picture, understanding how each episode contributes to the greater goal, but also how each episode helps define the details of that goal. In addition to being selective and episodic, the narrative format of Acts is also implicit in the way that its genre communicates much of its teaching. Broadly speaking, there are two main types of literature in the New Testament: narrative discourse and argumentative discourse. Argumentative discourse is literature that represents a sort of conversation, such as when a character in a book is talking, or when an author speaks directly to his audience. For example, the New Testament epistles consist primarily of argumentative discourse in which an author like Paul is speaking directly to the recipients of his letter. Of course, some epistles include snippets of narrative, and we even find the occasional song or proverb. But they are mostly composed of argumentative discourse. And the main point we want to make about argumentative discourse here is that it communicates most of its teachings directly and explicitly. When Paul wrote a letter telling his readers to think or to do something, he told them directly what he wanted. On the other hand, narrative discourse is the dominant type of literature in the four gospels, and more importantly for these lessons, in the book of Acts. Narrative discourse is literature that tells a story and provides teaching in a less direct way. To be sure, argumentative discourse appears in these books too, primarily in the speeches of certain characters, but the dominant literature of the gospels and Acts is narrative. And unlike argumentative discourse, which tends to teach things explicitly, narrative discourse tends to teach things implicitly, allowing the reader to infer its lessons. Narratives influence readers not through direct instructions, but in more subtle ways. They are designed so that readers will draw lessons from the attitudes, actions and words of the characters, learning to adopt those that are pleasing to God and shun those that are contrary to God's will. Think about it this way. For the most part, narratives like Acts appear merely to state facts. This happened, that happened, then something else happened. On the surface, it would appear simply to be a report of events. As we have seen, occasionally Luke commented explicitly on the significance of elements of his stories. But for the most part, he described events or facts with little or no comment. Even so, the reality is that his narratives were not written simply to report events. He had didactic motives as well, and used his narratives to communicate these ideas implicitly. Let me illustrate this idea with a story from my own life. When my daughter was very young, she had been told not to eat chocolate before dinner. But one evening she came to the table with chocolate on her lips. I asked her if she had eaten chocolate and she replied with a big-eyed denial: "I did not have any chocolate, Daddy." As a parent, I had two ways to deal with the situation. I could have addressed the matter directly and explicitly through an argumentative discourse. I might have said, "You are not telling the truth. I can see the chocolate on your face! You are in trouble." But I also had a narrative option, one that was more indirect and implicit. I might have taken my little daughter on my lap and said to her, "Let me tell you a story. Once upon a time, there was a little girl who had been told not to play in her best dress. But she played in her dress anyway and got it very dirty. What do you think about the little girl's actions?" A narrative rhetorical strategy like this works primarily on implicit levels. It invites the child to wonder, "Wasn't it bad that the little girl did not obey?" The beauty and power of narrative is that it communicates these kinds of ideas implicitly. If it is subtle enough, narrative involves the listener in the circumstances of the story. He or she becomes involved personally in ways that help the listener not to be defensive. It allows the listener to be much more teachable. About 70% of the book of Acts is presented in narrative. For the majority of the book, Luke was essentially saying to his readers, "Let me tell you a story about God's work in the early church." Of course, the story he told them was absolutely true. He invited them to enter the world of factual history. But he presented this history in the form of a story because he wanted his readers to infer conclusions from the facts he recorded. So, as we read the book of Acts, it is important for us to search for these implicit teachings. Of course, one of the chief ways to evaluate and apply any biblical narrative to our lives is to see how God reacts to actions that take place. Above all others, his words and actions are perfectly infallible. As a result, we should always take note of the things in the book of Acts that God approves and blesses, as well as the things that he disapproves or curses. Whatever God blesses must be good, and whatever he disapproves or curses must be evil. As we read the book of Acts, we should seek to emulate the beliefs, attitudes and behaviors that are pleasing to God, and to avoid those that oppose him. In addition to this, because Luke so heavily relied on the outlooks of prominent early church leaders, another reliable way for us to see Luke's implicit teaching is to observe examples Luke provided for us. When trustworthy people such as apostles, prophets and other respected church leaders did or said something, we can usually infer that we are called upon to be sympathetic toward them. Their actions were appropriate, and their witness is true. Consequently, our response should be to respond in our hearts to this call, and to model our own behavior and thoughts after theirs. And the reverse is also true. When characters in the book of Acts are condemned by the apostles or the church, we can infer that their actions were evil, and that we should not follow their examples. Now, these are by no means the only types of implications Luke made in Acts. But they do provide a relatively solid foothold for modern readers to begin learning how to make correct inferences from biblical narratives. With this understanding of the literary character of Acts in mind, we should turn to the discontinuities between the first century and the modern world that impact the way we apply the book of Acts. We must always remember that although the Bible was written for us, it is not written directly to us. We know explicitly that the original recipients were Theophilus and people in the first century A.D. So, in some sense, we are reading over their shoulder as we read Luke's book. We aren't so much hearing what Luke said to us as we are overhearing what he said to them. So, we should expect to find that at least some of the teachings in Acts apply differently to us than they did to Theophilus and Luke's other original readers. If we simply repeat what we see in Scripture, without taking these differences into account, we will frequently misapply God's Word in harmful ways. We will summarize these discontinuities between Luke's world and ours in two ways. First, we live in a different time than they did. And second, the world has changed quite a bit since the first century, so that we have different circumstances, different situations from those to whom Luke first wrote this book. We'll look first at the fact that we live in a different time from those who first received the book of Acts. It is very important, for instance, to remember that the book of Acts focuses on the apostles, the authoritative witnesses of Christ in the first century. Many of God's activities through the apostles were specific to that time and place in redemptive history; they were groundbreaking, foundational accomplishments that are never to be repeated. As just one example, the mere existence of apostles was unique. As we will see in a later lesson, there can never be another apostle. For one thing, to qualify for the office of apostle, a man had to have seen the resurrected Lord. For another, he had to be appointed to the office of apostle directly by God himself. So, while it is reasonable to say that Acts teaches us to respect and submit to our own church leaders, we do not have living apostles with us today. The best we can do is to submit to their written testimony in the New Testament. Unfortunately, many Christian groups have looked to Acts for a model of Christian living that should be precisely followed in every age. For instance, Acts 2:1-4 teaches that the Holy Spirit was poured out in dramatic, miraculous ways on the day of Pentecost, and that those who received him began to proclaim the gospel in various languages and dialects. This was a special event that occurred at the initial outpouring of the Spirit in order to empower the apostles and other early believers for service to Christ. Similar events occasionally occurred in Acts, but only as a direct result of the work of the apostles. What is constant in Acts is the fact that every believer receives the Holy Spirit in order to be transformed in his character and to be a witness. What is not constant in Acts is the presence or absence of particular manifestations of the Holy Spirit. Nevertheless, some branches of the church insist that even today a separate filling of the Holy Spirit must always be manifested by proclaiming the gospel in different languages or tongues. When well-meaning Christians fail to account for the discontinuities between the first century and our day, they often try to apply the teachings of Acts in inappropriate ways. And besides living in a different time than the original audience of Acts, we also have different circumstances, such as different cultures and personal situations. All the events in Acts took place in the historical circumstances of the first century, and many aspects of Luke's accounts are conditioned upon these historical and cultural circumstances. Unfortunately, in an effort to be true to the teachings of Acts, many Christian groups through the centuries have tried to return to the cultural practices of the first-century church. For instance, in Acts 5:42 we read that the church met in private homes. On this basis some Christians have insisted that the church today must meet in homes and not in church buildings. And in Acts 6:1 we find that the church in Jerusalem was providing food for widows. As a result, some Christians today insist that every church must have a food service for widows as part of its ministry. Now of course, there is nothing inherently wrong with the church today meeting in homes or serving food to widows. But we must recognize that these practices were conditioned upon the circumstances of the first-century church. For example, persecution necessitated their meeting in homes. But in parts of the world where there is little or no persecution, the church does not need to meet in homes. Insofar as our circumstances resemble theirs, these may be legitimate applications of biblical principles. But insofar as our circumstances are different, we may be obligated to apply these same biblical principles in different ways. In fact, we often find different applications of the same principle even in the book of Acts itself. For example, in Acts 2:44-45, Luke described the members of the church in Jerusalem as owning their resources in common. Yet, within the book of Acts itself we find that many of the churches established by the Apostle Paul met in the homes of wealthy citizens or city leaders, with no mention of communal living, and no criticism of either practice. From the very beginning, the church has recognized that the same biblical principle must be applied in ways that are appropriate to the current circumstances. We must never settle for mere imitation as a substitute for responsible application. Having described the literary character of Acts, and broadly outlined the discontinuities between Luke's day and ours, we should turn to some significant continuities between the first century and the modern world. We may summarize the continuities between Christians in both time periods by saying that we have the same Triune God, who exists in the persons of the Father, the Son and the Holy Spirit; the same goal, which is to build the kingdom of God in Christ; and the same gospel, the same message of salvation and redemption that requires us to respond in faith, repentance and obedience. Let's look first at the fact that we have the same God as the Christians in the first century. Luke's record of salvation history reminds us that we serve and testify to the same Lord Jesus Christ that the apostles and early church served. Each Christian is empowered by the same Holy Spirit who was present in the first century. And we do all for the glory and honor of the same Father. Our Triune God has not changed. God worked through the gospel in magnificent ways in the first century, and he continues to do so today. If God seems far removed from your personal life, or from the life of your church or denomination, then things are not as they ought to be. If we do not see God at work, bringing salvation to the lost and building his church, then we must turn to God in repentance and faith, asking him to continue his gracious work of salvation history in our lives and churches. Besides having the same God, Christians today have the same goal that the church had in the book of Acts. In the book of Acts, God's purpose was to build his kingdom in Christ through the apostles. They worked toward this goal by nurturing the church and increasing the size of the church through the gospel. But they also knew that expanding the kingdom of God to fill the whole earth would take more than a dozen men working for a few years, so they prepared the church to labor alongside them and to continue after their deaths. We might say that just as Jesus assigned the apostles the task of building his kingdom, the apostles assigned this task to the church. Of course, this task of kingdom-building will not be finished until Christ returns in glory. So, the goal of the modern church is still to conform to God's mission of building his kingdom in Christ, to bring the whole world and all of life under his Lordship. And one of the primary ways we do this is by relying on the apostles' teachings about salvation, ethics, godly character, relationships, evangelism and every other matter in life. After all, if we are to honor and obey Christ, the church must submit to the authoritative witness of his apostles. For example, Luke was careful to record the different ways the apostles expanded the kingdom across many cultures and situations. And following their example, we can use similar means to further the goal of the kingdom in our own day. Yes, we need to make adjustments in light of the discontinuities between the modern and the ancient world. But since we seek to submit to God's stated mission rather than to pursue our own agenda, the goal and the principles behind it remain the same in every generation. Finally, in addition to having the same God and the same goal, modern Christians are called upon to proclaim the same gospel as the church in the first century. No matter how much the world changes, one thing remains constant: human beings are fallen in sinful rebellion against God and alienated from him, desperately in need of redemption. We all need the same salvation. And that salvation is available in Christ, as he forgives our sin and brings us into his kingdom. This is the gospel message the apostles taught in the first century. It is the gospel message Luke proclaimed in Acts. And it is the gospel we must embrace and submit to today. Believe in the Lord Jesus, and you shall be saved — you and your household (Acts 16:31). This simple message has profound implications. It encompasses all aspects of our individual and corporate lives, challenging us to be transformed, to become gospel witnesses to the world. This gospel remains the same for all people in all places and all times. All people are called to repent of their sinful rebellion and to trust in Christ. All people are to submit to his lordship and to build his kingdom. This call must go out to every person in our day, just as it has been proclaimed throughout the world since the days of the apostles. The summons to obedience is for Jews and Gentiles, rich and poor, male and female, respected and despised. It overcomes all types of resistance and barriers, for it is the word of the reigning Christ, empowered by his Holy Spirit, for the glory of his Father. As the book of Acts teaches, no trial, no tension, no opposition is sufficiently powerful to oppose the growth and spread of redemption. This is why modern Christians must be authentic and bold in proclaiming and affirming the gospel of the apostles, calling everyone to repentance and faith in Christ, and joining them as loyal citizens of the kingdom of God. In this lesson we have looked at the rhetorical strategies Luke used in the book of Acts, the content of his work, and the appropriate first steps to take toward the modern application of his teachings. Our exploration of these issues should provide us with a way to understand, appreciate, and live by his authoritative teachings in our own day. In many ways, the book of Acts serves as the doorway between the time of Christ and the time of the modern church. It explains how Christ's person, work and teachings were understood and applied in the early church, and it lays the foundation for the ways modern Christians are to understand and apply those same ideas in our own lives. So, the more we are able to recognize Luke's purposes and methods in Acts, the better equipped we will be to live in ways that honor and serve our risen King.